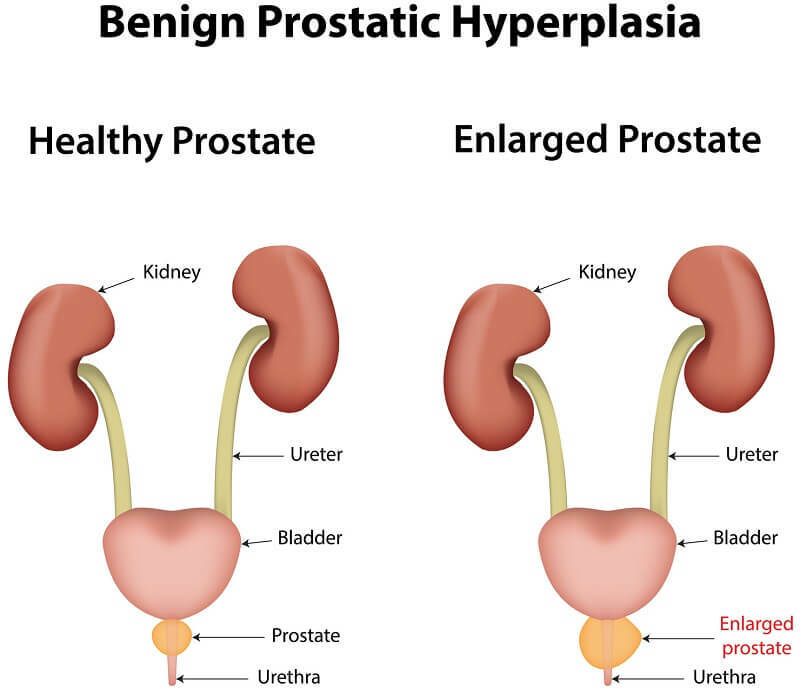 Benign Prostatic Hypertrophy (BPH), also called Benign Prostatic Hyperplasia, is a condition where the prostate gland gets enlarged, often due to old age. This prostate enlargement causes various issues within the urinary tract system, such as a frequent need to urinate or difficulty urinating. As its name suggests, Benign Prostatic Hypertrophy is non-cancerous. However, if left untreated, the symptoms can worsen with time and cause more serious issues such as kidney problems. Thus, it is important that if you notice any symptoms related to a big prostate, you report them to a medical health professional immediately. While the symptoms may vary for each patient who is going through benign prostate enlargement, the most common symptoms that patients face are mentioned below. Frequent need to urinate at night. Weak urine stream, or urine stream that starts and stops abruptly. Dribbling without control at the end of urination. Feeling that the bladder has not been emptied. Hematuria (blood in the urine). Incontinence (loss of control over bladder to the point where you cannot hold back your stream). All of these symptoms are mostly noticed due to a big prostate, which presses up against other related organs in the urinary system and causes these issues. Why Is Identifying a Big Prostate Important? The prostate gland is a big part of the overall urinary system. It is located right under a male’s bladder, with the tube that transports urine to the urethra and out of the body passing through the bladder. When the prostate gland gets expanded, it obstructs that tube, which causes the bladder to face difficulties in pushing down the urine and transporting it out of the body. Only by identifying a big prostate can these issues be addressed to manage BPH. What Causes a Prostate to Enlarge? Experiencing a big prostate is a very natural part of the aging process. As we grow older, our muscles and tissues are subject to hypertrophy/hyperplasia, and expand overtime. This happens in a number of organs and glands, and a benign prostate is no exception. Having an enlarged prostate by itself is not something that can be preventable as you get older. It is a condition of old age and it is so common that 9 out of 10 males in their 80s experience it. However, having a big prostate does not always mean that you will have any or all of the aforementioned symptoms at once. Some men even in their older age do not experience most of these symptoms at all; yet there are some who notice them frequently. As with all medical conditions, the symptoms, their frequency and their intensity depends from person to person, which is why seeking medical help for benign prostatic hypertrophy is important, so that these symptoms and the condition could be addressed and controlled before they get out of hand and cause bigger problems such as long term bladder or kidney problems. How Can You Diagnose a Benign Prostate? When consulting a medical professional, one thing that you should keep in mind is that the symptoms and diagnostic tests for benign prostate enlargement can be very similar to those of UTIs, kidney problems, and prostate cancer. However, you should be confident and take assurance in the fact that having BPH is by no means a doorway to prostate cancer, and having it does not increase your chances for getting prostate cancer either. When you visit your medical professional for BPH treatment, you will be asked a series of diagnostic questions, and will also be required to undergo a physical examination. This would include a digital rectal exam. In most cases, a biopsy would also be required to negate the possibilities of prostate cancer. During the biopsy process, your doctor will extract a very minute part of your prostate tissue and send it to the laboratory for analysis to confirm if you have BPH or is it a set of symptoms brought about due to prostate cancer. Your medical professional may then give you some medications to control the symptoms until you receive a definitive report through the biopsy. This would ensure that you do not feel physical discomfort over the duration for the biopsy results to be returned. Once your biopsy results are in and you have a final result about having BPH, then you will be on the path to start targeted treatment. How Can You Treat Issues Caused by an Enlarged Prostate? There are a few treatment options for benign prostatic hypertrophy, which depend upon patient to patient and can be best prescribed and advised by your medical professional. Some of the treatment options require a lot of patience in order for changes to take effect. For instance, your medical professional may prescribe a few lifestyle changes or supplement intake to check if your symptoms can be controlled through them. You would also be prescribed targeted medication that would resolve the issues that you feel due to your BPH. These might include over-the-counter painkillers, as well as 5-alpha reductase inhibitors (5-ARIs), which inhibit the prostate growth; and phosphodiesterase 5 inhibitors (PDE-5), which provide symptom management capabilities. In extreme cases, surgery may also be prescribed. However, this option is rare and it is only employed when you start showing obstruction to the point where you cannot urinate at all, have repeated blood in your urine stream, or experience kidney stones. How Natural BPH Treatment Could Help? Out of the options mentioned above, having natural BPH treatment is by far one of the most effective methods to manage symptoms related to benign prostatic hypertrophy. Natural BPH treatment may comprise of steps including but not limited to limiting the intake of liquids, participating in light exercise, adjusting your sitting and walking positions and other related aspects that your medical professional could guide you through. Once again, the treatment options may vary based on your specific condition. However, a credible medical professional would be able to help you with the process easily and assist you to reach the best decision and treatment option that is optimal for you.